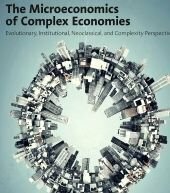 Elsevier is developing a range of volumes reviewing scholarly research across complexity in economics, under the scholarly editorship of Wolfram Elsner (Bremen), Torsten Heinrich (Oxford), Magda Fontana (Torino), and Marco Raberto (Genoa). The new concentration will address the theory, applications, methods and epistemology of research in complex and adaptive economic systems, dynamics, and agents. It seeks to reduce the role of teleological and equilibrium models, advancing instead a focus on real-world systems with new advances in agent heterogeneity and multi-agent interaction. It acts as a forum and ‘landing ground’ for the evolving discipline, with subject matter experts in the international board and team of contributors from highly ranked institutions ensuring a watermark of quality and authority. Focusing on specialized research monographs, introductory handbooks and selected multi-contributor reference works, volumes review applications of complexityanalysis where relevant, in areas including macro, finance, and economic policy. Transdisciplinary perspectives explore connections to econophysics, neuroeconomics, data analysis, and other useful domains often rarely connected with the standard curricula. The editors welcome and invite your involvement in this concentration. If you are interested in contributing contact me.